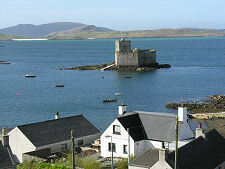 Kisimul or Chiosmuil translates as "the rock in the bay" and the origin is obvious from the castle's location on its rocky island in Castle Bay, on Barra's south coast. And the castle is in turn the origin of the name of Castle Bay, and that of the village of Castlebay which curves around the north side of the bay. 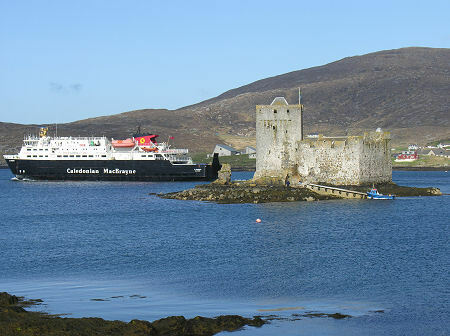 It had been possible to visit Kisimul Castle for many years, but only on a couple of afternoons a week. This all changed on 31 March 2000 when the Chief of the Clan MacNeil leased the castle to Historic Scotland (now Historic Environment Scotland) for 1,000 years. In doing so he ensured the work of his father to restore the castle will be safeguarded forever: and that the public can visit this remarkable building every day from April to September. The origins of Kisimul Castle are obscure. 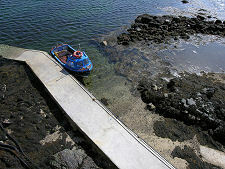 It is possible that the rock in the bay was fortified as early as the 1000s, and there are claims that one of the courtyard buildings was originally a chapel built by St Cieran, possibly at a very early date. But the earliest significant structures still standing today probably date back to the early 1400s. 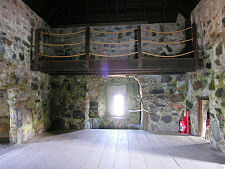 Building probably began after the granting of Barra to Gilleonan MacNeil in 1427 by Alexander, Lord of the Isles. The original design had a massive three story tower house accompanied by a curtain wall shaped to fit the rock on which the castle stands. Inside the wall a number of other structures were built, including the hall you see today and the chapel. In the late 1400s or early 1500s a kitchen and the Tanist's House were built in a range adjoining the tower house, and the curtain wall was raised to the height you see today. 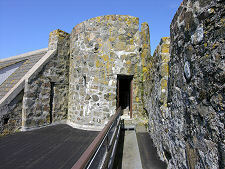 This was defended by external wooden hoardings with walkways along the outside of the top of the wall. At the same time the gate was moved to its current location. 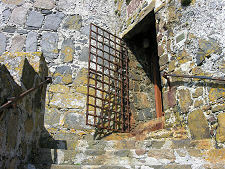 Further changes were made in the 1600s including the blocking of a postern gate facing the village. 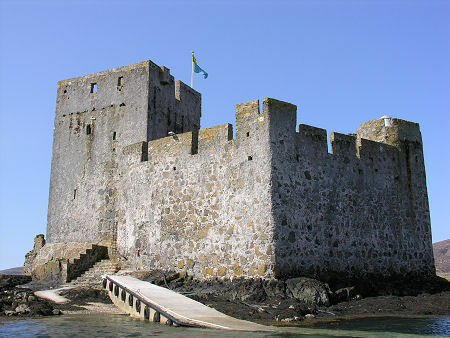 During the 1500s and 1600s Kisimul Castle successfully withstood several attempts to take it by the MacNeils' enemies, but by the mid 1700s its defensive strengths were less important than its lack of day to day comfort and convenience, and the castle was abandoned as the MacNeils' main residence. Some time later Kisimul Castle was gutted by fire, and to make matters worse it was considered fair game as a handy source of ballast by Castlebay's thriving fishing fleet in the 1800s. By the 1930s much of the end of the castle facing the village had been destroyed, with the Tanist's House robbed out entirely and part of the curtain wall reduced to sea level. What other Clans had failed to take from the MacNeils by force was lost in 1838 when the 40th Chief of the Clan, Roderick MacNeil became bankrupt and was forced to sell Barra to Colonel Gordon of Cluny for £38,050. Colonel Gordon, who had also acquired South Uist and Benbecula, then proceeded to clear much of the land of its tenants to make way for sheep. 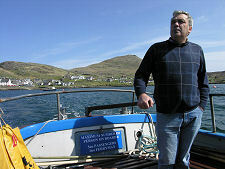 In 1851 most of Barra's residents were forced to board ships bound for North America, all their belongings and assets confiscated before they left. In 1937 the American architect Robert MacNeil, who had been recognised as the 45th Clan Chief of the MacNeils, visited Barra soon after the opening of the airstrip on the island. 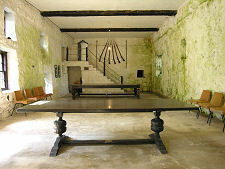 He purchased most of the Barra estate lost to the family in 1838, including Kisimul Castle. The following year he began to restore the castle as the family home of the MacNeils, a process that was to take until 1970 to complete. The restoration was done so well that today it is difficult to believe that significant parts of the castle date back only decades rather than centuries. 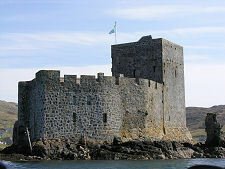 It was Robert MacNeil's son, the 46th and current Clan Chief of the MacNeils, who in 2000 made over the 1,000 years lease on Kisimul Castle to Historic Scotland. 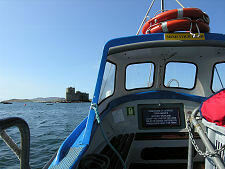 A visit to Kisimul Castle begins with a short boat trip from the pier in Castlebay to the castle's pier. 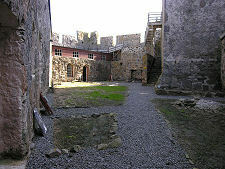 For those who are used to seeing castles comprising a curtain wall with very little inside it, the first sight of the castle's courtyard is very striking. With complete ranges of buildings still standing, you get the strong sense of travelling back in time. Before you go through the narrow gateway it's worth keeping a lookout for the structure on your left that is variously thought to be a harbour for clan galleys, or a trap designed to catch fish in the falling tide. 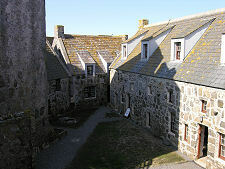 Much of the interior of the castle is accessible, though some of the rooms above the hall are still used by the MacNeil family. 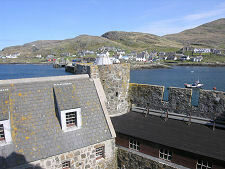 For safety reasons the top of the tower, which contains some narrow and tricky walkways, is not normally open to the public, but stunning views of Castlebay are available from the walkway around the curtain wall. 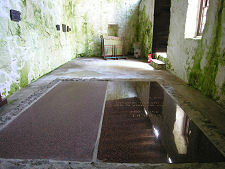 A visit to Kisimul Castle is a fascinating experience, in part because it was until recently a family home. As you wander around it's easy to overlook the 200 year period of decline and ruin. 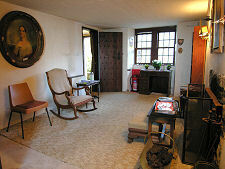 Instead what comes over is the very unusual feeling of being in a real and living castle.